Christmas comes but once a year, but to tell you the truth it sometimes feels more often. Approaching that time of year again, I felt the need to repeat the idea of a painted Christmas card fro Xmas 2010. 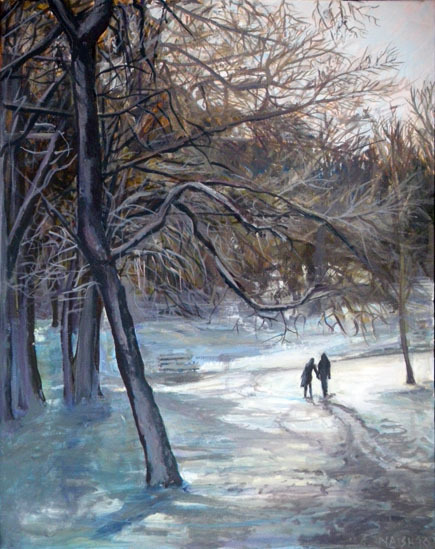 With such a good archive of images from snowfall in 2009, (See painting 1), I decided once again to paint the snow in Wardown Park, Luton. This was a fairly rapid piece and I utilised a technique that I had picked up from a Saroja French class at an NEC expo. The idea was to use strong areas of colour and build from these. Though the original had been an exercise in Acrylic ink, I used this as a jumping off point with my Atelier interactive acrylics. I thought having a under-painting in a strong colour would both help to further prime the canvas and hints of colour in the expanses of near white. I painted around the edge of the thin canvas (and didn’t continue with the later layers) and so can still see these colours as the painting is unframed as I write this description. So the sky was an orangy yellow colour, I think an unmixed “Jaune Brillant”; the mid tree section was a dark brown; and the snow at the bottom was a sky blue colour. I find the image slightly too rushed; but my mother is quite keen – whose to argue.